PLEASE HELP and get me out of here! I do not understand what happened. Something went very wrong. I'm in this place in a cage. Some sort of protection from a very unfamiliar crowd of foreign Cats. Very, very scary Cats!!! My partner left me here. WHY???? I am so stresssed I can neither sleep nor eat. PLEASE can I go back to a home!!!??? Quiet, clean, comfortable, - safe!!!??? I want to be secure, I want to be cuddled. I very much need to be loved. Carer's comment: Her owner was moved abroad unexpectedly. So this beautiful, young Cat with its owl like, golden eyes was taken to the Sanctuary. Affectionate, pretty, perfectly healthy. A lost home Cat in great despair. You could save her life! And by doing so enrich your own. She is a very frightened Sweetie. Two lovely sisters Cagney & Lacey, estimated age 1 year. 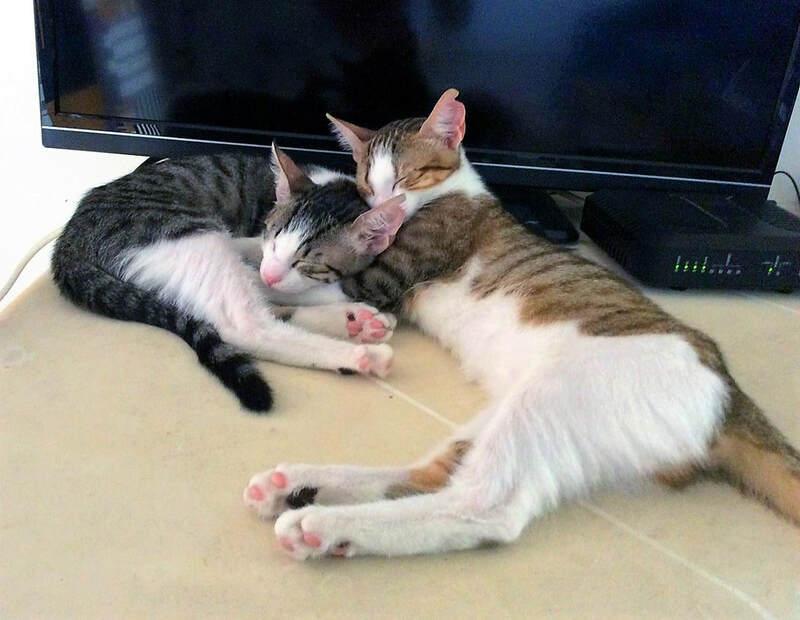 They love each other very much and could never be separated, so would need to be adopted together. Rescued from wasteland as very young kittens, they are now both thoroughly checked up by the vet, neutered and very well domesticated, always using their litter tray. ​Cats are eagerly counting down the days. On Sunday 7 January three lucky raffle tickets will be drawn in their presence. A BIG thank you to all who bought tickets in support of the eagerly anticipated enhancement of the cats’ garden which will offer climbing structures, resting places, green, breathing plants and intriguing scents. You are helping a dream turn into reality. ​I'm a strawberry coloured cat. That means I'm special. Sensitive, brave, dominant, loving...Some call my colour sandy or buff, some say I remind them of a little dog. Perhaps because I come running when I'm called? 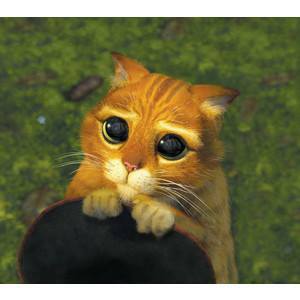 Because I will follow you around hopeful for your attention? Or because I'm usually upbeat, positive, alert and can be very funny??? Because of my short stubby tail and pointed ears? Because of what they call my soulful eyes? But I'm a tom cat. I can stand up for myself and like to be the number one at meal times. But what I really want is to be your number one. I want to count for you, I want to be loved, I want you to realize how very, very special I am. Trying to survive in all weathers outside a well known supermarket, I never experienced luxury, but do so much appreciate comfort, attention and love. Carer's comment: Scottie's so lovable and unique character makes it hard to accept that finding him the home he deserves is almost "mission impossible". His courageous approach to life makes you laugh and weep at the same time considering the many handicaps barring him from ever being adopted. Not only does FIV make Scottie vulnerable to any infection from other cats, a torn ligament makes hind leg stick out at a funny angle when he's sitting down and he had a most unfortunate tail amputation. So you will need a tiled floor for his litter box, be prepared to clean up after him or imaginatively and above all patiently experiment with newspapers and various (stacking?) arrangements of differently sized litter boxes. However, IF you are the right person and Scottie's perfect match, it will be more than worth it. For most of his life Scottie has not only been starved of food, but also seriously starved of love. His enormous heart and determined hope helped him to survive so far. But winter has come, time is getting on and this immensely lovable, funny, quirky creature with his eloquent eyes and enormous courage needs special care and individual comfort. And love from a very special individual who understands. ​CAN YOU FIND LISA A (FOSTER) HOME? Once I was young and beautiful. Small, but precious. So sweet tempered. Lovely, loving, loved. I had a home and I was special. When I became old, I was no longer wanted. Like a piece of unwanted furniture I was dumped in the street. Why? I did not understand. When I enquired confidently, the door was shut into my face. I had always been small and delicate. Street life is tough even for the young and fit. How I suffered! I lost my health, one eye and all what remained of my looks. 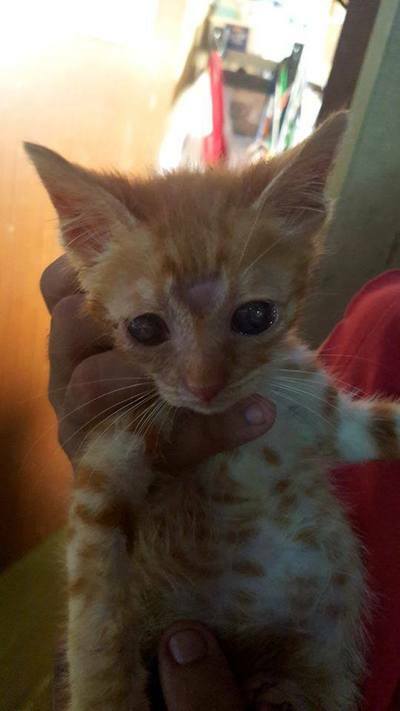 Half blind and extremely week I was finally rescued. I am recovering . Not just with the help of medical care, but mainly with he help of love. To survive I need a loving owner. Someone who picks me up and cuddles me.. Love is the sole reason for my existence..I cannot hold out much longer. When somebody kind approaches, I hope. I won't let you go! I put all my energy in keeping up with you. I follow you as fast as I can. And then I try to climb on you. And sit on you . AND PURR. Then I am HAPPY. Then I LIVE. If your sight is not impaired, you probably already have looked at my picture. Can you see me, - with your heart? Comment: The perfect fosterer or owner for Lisa might not look at our website, but you might know them. And you might be the ESSENTIAL, LIFE - SAVING LINK FOR LISA! Time is running out for Lisa's frail body and desperately loving soul. She URGENTLY needs a kind and caring person, capable of looking after her well, but possibly also in need of regular rest, relaxation and kindness. This person or members of the family would spend at least part of the day at home, working or resting. Lisa loves with every fibre of her small body and sitting on your lap or even chest is bliss for her. We try to substitute with hot water bottles which stop her crying, but the strain she puts onto her little bottle to reach a human, needs to be seen to be believed. To survive (!!!) Lisa needs much better care and MUCH more love and company than a sanctuary can give. Please donate to Lisa five minutes of your time and THINK carefully: You might know Lisa's saviour. You can help our Cats in so many different ways, and sometimes it means - just - a visit or a phone call to a person you know. Don't leave it too long, there is hardly any time left. Meet Wobbles, our special needs baby boy. Wobbles is affected by a rare condition called "Cerebellar Hypoplasia". 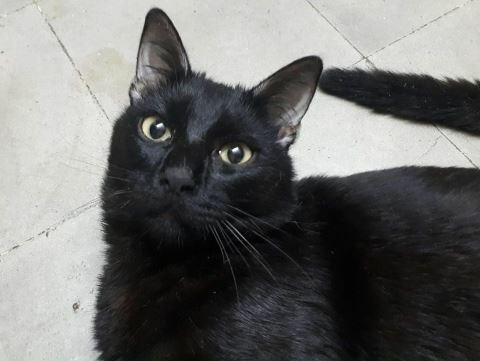 Unfortunately like us humans, cats are not born equally lucky, and this gorgeous baby is looking for a special home that can guarantee him life-long love and attention. Wobbles would need more help than any other cat, thus a very dedicated family would be required. Wobbles is 8 months old. Friendly, Responsive, Loves cuddles and will stay held in your arms for ages. Needs help to eat and drink although can muddle through, if he needs to . Needs help on the litter. Will often wait for you to put him on and then will do his business. If he needs to go and your not around he will do it where he is. He may roll in it and need a wash.
Wobbles also loves other company of other cats. Hi! Hello dude! I’m Timmy. I’m a teenager! I used to have a home as the companion of an elderly owner.As I grew up, I started exploring, jumping and playing...I was having so much fun! But, my owner thought I would be better off in the street. I don’t know what I did wrong!? For a house kitten the street is hell's scary: no food, no water, no shelter, no bearings, no love. Scary cars, scary cats ,scary noises,scary smells, ,SCARY, so, so scary!!!! A kind, caring person took pity on me and drove me to the CSAF-Sanctuary. It was so nice to be off the streets and I wasn’t so scared any more. In the Sanctuary I am liked by the carers as I am gentle and very affectionate. I love being loved and loving in return. I’m trying very hard to find somebody who'll like me enough to take me HOME. If you are that person, just ask for TIMMY! I will be waiting for you! Hello Human! I'm Ella and very fortunate to be here. I rest a lot near the carers as I feel safe with them. I'm so thin because I'm a bit too nervous to eat. You see the other cats are so big! You never know who's a bully, right? As I am very fragile, I don't want to get hurt..and I don't know how to fight. I am a very delicate, sweet, and affectionate cat. The carers here think I would do so much better in a home, The Sanctuary is too stressful for me. They’re right! I so want a quiet home of my own where I can feel safe and loved. Just ask for the tiny Tal Madonna with the pink collar. That's me, Ella! Thank you Human! Despite being a special needs kitty i still lead a 100% normal and independent life.. I just need to be in a home that keep me forever and does not do much changes to my environment. Beige (buff, strawberry coloured), perhaps 5 years old (?? ), lovely character & temperament, very sweet, but definitely not a toy, but an individual with his own mind, quietly inquisitive, intelligent. If there are other cats, Sandy can be both very loving, but also defensive/dominant when others try to take advantage. He snuggles up with weaker cats, which he licks. He also licks himself vigorously. A possible cause for this is stress and both licking and eating may be strategies to soothe himself. Sandy even lets you clean his ears, provided there are sufficient cuddles to be had before and after. As he can only see half of what a normal cat sees, there is a certain insecurity which a sensitive, caring owner should - with time - be able to totally alleviate. Judging by other successful adoptions of FIV cats, once happily homed Sandy will probably increase in health and playfulness, lose weight and might turn out to be younger than assumed. If you are willing to invest empathy and love you need look no further for a LOVELY tom, great companion and an asset to your home. Quiet and sensitive gentleman of striking appearance with deep, sincere feelings seeks caring partner and comfortable home. Forever. Carer's comment: Probably one of the most beautiful toms in the Sanctuary Leon values his personal space and freedom. He has been much loved in his life and returns affection with unswerving, undemonstrative loyalty. His reticence increases with illness, When Leon is not well he tends to hide himself away, possibly in order to avoid losing further status. He also preserves his dignity and will only be treated and handled on his terms. Leon is not a cat to be grabbed, but a gentleman to be asked. Leon has fought FIV all his life and the better he is supported the greater are his chances. Under his cream-brown-and-white feathery coat stands a tall, but lightly built, quite delicate cat. In order to help Leon put on weight, gingivitis (gum inflammation) needs to be monitored. When his gums are inflamed, Leon needs gentle pain relief, smooth, pureed food and help with his grooming. As Leon has not built up a lot of weight, illness must be taken seriously. Another winter spent in the Sanctuary meant contracting various ailments which needed to be medicated. Medication however puts increasing pressure on his kidneys. In order to survive Leon needs a home. You will find Leon a grateful, most agreeable, well mannered and intelligent partner. He is not as shy as it might seem, but might take some time to make up his mind about you. After all the change he has experienced, Leon deserves an enjoyable, steady courtship, not to be rushed! Leon loves some space to explore and to withdraw to, but as time goes by now prefers a comfortable basket with a hot water bottle . Will you open your home and your heart to Leon? Will you save his life? am beautiful, stunning, a most attractive and agile eye catcher. I am loving, trusting, intelligent. I once was a prize, a treasured treasure. I used to be, a sensitive but light-hearted extrovert. But I am getting more confused and disheartened by the day. To be taken to the Sanctuary by my most special person was a big, big shock. I look like a gentleman, but I`m still a tall teenager. I still had hope and trust. Things would take a turn for the better. Somehow. But they didn’t. The other cats frighten me. They won’t let me eat. I’m losing weight, rapidly and visibly. I have learnt to defend myself. At least I’m tall and fast. The carers love me, really. But nobody has time for me. I still try very hard to win a heart. Anybody’s. But my hope is dwindling; DAY BY DAY. I was adopted recently, but the other cats were old, they didn’t like me. Perhaps I was too playful, too happy to have found a home again? If you want a lively, strong but gentle partner for life and have time and love to share, can you take me home very soon? To save him he needs understanding, committed owners who will provide a stable and loving home for life. Timmy is so typical of the amazing ginger- and-white mind readers: sensitive, intelligent, interested in human contact, very affectionate. If you ever knew a ginger and white cat, you'll know what immense loyalty and love they bring into any relationship. Despite the disappointment of losing home twice in his still young life - Timmy remains sweet and gentle, even if slightly subdued. Timmy will give us humans a third chance. His spirit is not broken, - yet. If you want a wonderful companion and are prepared to look after him body and soul, Timmy is your choice. Adopting him will be a life-long commitment and joy. Hi! I’m Timmy. I’m a teenager! For a house kitten the street is hell's scary: no food, no water, no shelter, no bearings, no love. Scary cars, scary cats ,scary noises,scary smells, SCARY, so, so scary!!!! A kind, caring person took pity on me and drove me to the CSAF-Sanctuary. It was so nice to be off the streets and I wasn’t so scared any more. In the Sanctuary I am liked by the carers as I am gentle and very affectionate. I love being loved and am loving in return. I was trying very hard to find somebody who'll like me enough to take me HOME. On third January 2018 my big day came. I was chosen! A friendly couple wanted me and I very much wanted them. I climbed into their cat carrier as quickly as I could and lay very still. Best behaviour. It was unbelievable! My dream come true!!! But at home their cat didn't like me. NOT AT ALL. For 6 days we all tried soo hard. But she would not give up: "My home! ", she said, "My special people!! Either you go or me, and it's not me!!!" So I am back again, - still waiting for my special person. If it's you, just fill in the form below and mention me, TIMMY, in your comment! I am blind. Can you imagine what this means? I can not see you approach. Suddenly I hear your voice VERY close, unfamiliar hands touch me unexpectedly. Big shock, danger, flight or fight. But I cannot see where I can escape to either! Speak to me softly and clearly and let me figure out where you are, then we'll be fine! I used to stay in defensive position -Ears back, paw lifted, stressed…I am no longer like that. I‘m an old lady now. I still struggle with the attitudes of cats. Most don‘ t realize I can not read their body language. I cannot see their bare teeth, their lowered head, their fixed challenging stare. Unless they hiss, I can not react to warnings or threats. Some think I‘m cool and leave me alone. Others go for me when I do not heed their warnings. Life was never easy for me, but I survive. When our Sanctuary was on the blazing hot roof of the Machina in Senglea I loved soaking up the sun. To protect me my carers put up a little umbrella for me where I could lie in undisturbed luxury like a queen. That’s how I got my name, Queenie. Specklebottom is for the distinctive marbling of colours on my behind. My carers tell me I’m very beautiful – like a piece of rare quartz. When the Sanctuary moved to the Cospicua fortifications I was homed in the 2nd enclosure where the more mature and fragile cats live. We are more considerate in here! Cats who fight go out! 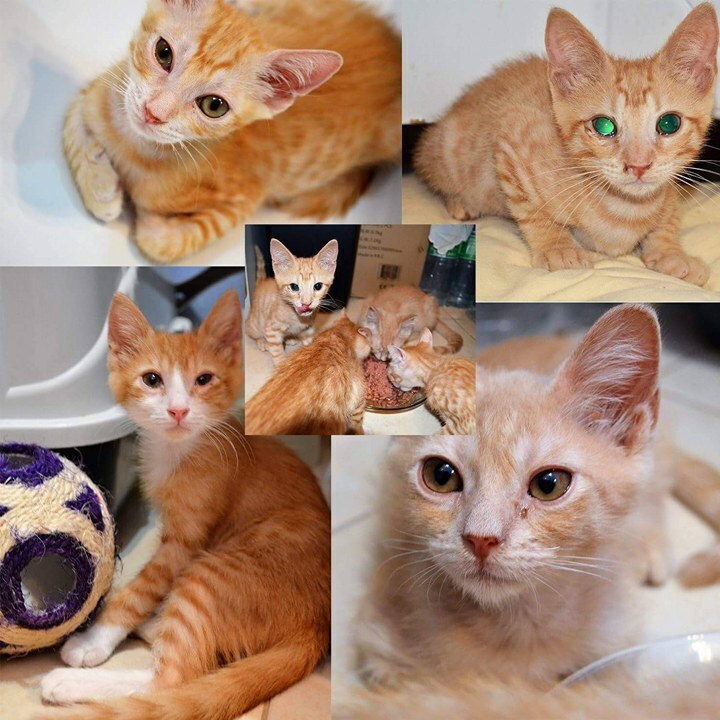 Carers try to put water, food and litters always in the same place so that we two remaining blind cats can find them. There used to be three of us. Three blind cats! Blind, ancient and so tiny, Pupa was my very best friend. When we woke up we used to circle the enclosure, looking in EVERY basket trying to find each other! 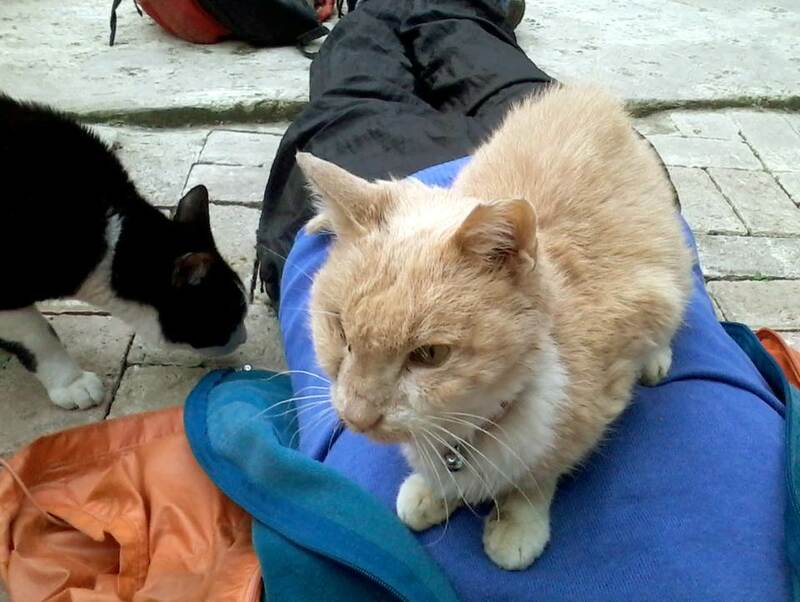 The other cats were not pleased when we climbed on them, but we were determined, we never gave up. We circled and circled sometimes following each other without realising it. It pulled at the heart strings of all who watched us. And when we finally found each other : the joy! !!! But who loves us blind ones? Cats think us strange as we move in an unfamiliar way, slowly and hesitantly where they glide gracefully and jump with confidence. Humans we love, but normally notice them far too late. We cannot advance purring and smiling like the other lonely cats who can see. We blind cats don't know where you are. But whenever my name is spoken I look up. And I hope it means Attention. Love. Care. For me! I'd love to meet you! Would you visit me? Ask for Queenie in the 2nd Enclosure. I'll be waiting for you!!! Queenie is a wonderful old lady with an unfailingly upbeat and stoic character, infinite hope and loneliness. In winter she had her last teeth removed, thorough grooming therefore is impossible for her. Now just being lovingly brushed is sheer unexpected ecstasy. Who will do for Queenie what she so reliably did for her old friend Pupa who let no carer touch her? Queenie will purr, knead with her feet, roll on her back and do everything to show you how very pleased and comfortable she is. 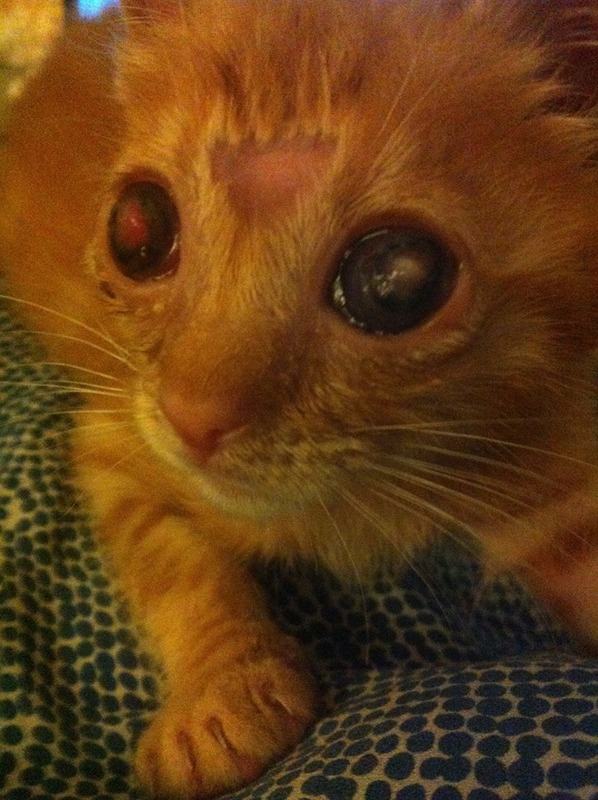 Surviving as a blind cat is not for the feint hearted. Queenie is not only consistently genteel, but also a very courageous elderly lady. Seeing her climb on benches and shelves and afterwards when she can‘t find her way down observe her determinedly diving into the unknown descent will take your breath away. Obviously a considerate owner will prevent such life threatening situations and make sure Queenie only moves where she can SAFELY return to familiar surroundings. Only once did she wander through a door left open out of her enclosure. After scouting her way forward through unknown terrain, stumbling across a multitude of unfamiliar cats, she decided to rest in the shade of a bench. When I found her she was not alone. One of the big, old, slow moving toms from her enclosure was resting next to her. We always thought he was past noticing anything……. What is particularly touching is that Queenie‘s gratitude is so visible and immense. For being put into mild spring sunshine - in a cage - for a while. For the hot water bottle in cold stormy winter nights. For an ice pack in the heat of the summer. With all the care we try to give, especially in extreme weather, we have to divide our time between so many! Queenie will NOT survive another winter in her open, drafty enclosure. Not even if she gets to top priority on the hot water bottle list. She will contract and succumb to her chronic winter flu, her stuffed nose won’t allow her to smell the food, her appetite will wane, taking medications will become a problem and jeopardize kidneys and liver. No sight, no smell… and how often will she actually hear her name being coaxingly called, how often will she be sought out and touched by a discerning kind visitor?? Queenie is extremely easy to please and has minimum requirements. However as with all older cats be prepared for vet visits. A kind understanding and patient vet specializing in older cats would be invaluable. There is so much we can do with good advice and inexpensive care to prolong the lives of basically healthy cats. Will Queenie be happy with a second resident cat? Think of a very kind and blind old grandmother. What sort of partner would you introduce into her daily life? Some cats are amazing with blind or handicapped partners and their wonderful relationships are a constant source of wonder and admiration- Others are insecure bullies who can make their fellow cats’ lives hell without the owner having the faintest idea. If you fall for Queenie, we are sure you are able to assess other cats as well. As she well knows herself, Queenie hardly ever gets noticed. A motionless brown bundle resting somewhere on the floor. It needs a special person to take a second glance and patient approach and to recognize Queenie for what she really is: pure gold, burnished and polished, speckled, and shimmering.